One of the features of the modern PC trade show is that someone somewhere is going to show off a chassis that either does something crazy, looks crazy, or makes you go ‘eh, what?’ (ed: it gets us every time). In recent memory that includes the In-Win case that stood up and presented itself, the iBuyPower Snowblind LCD-as-a-case-panel from last year, and a 40kg aluminium behemoth, another In-Win design. This time, it’s Riotoro’s turn. Morpheus is all about the mighty morphing. 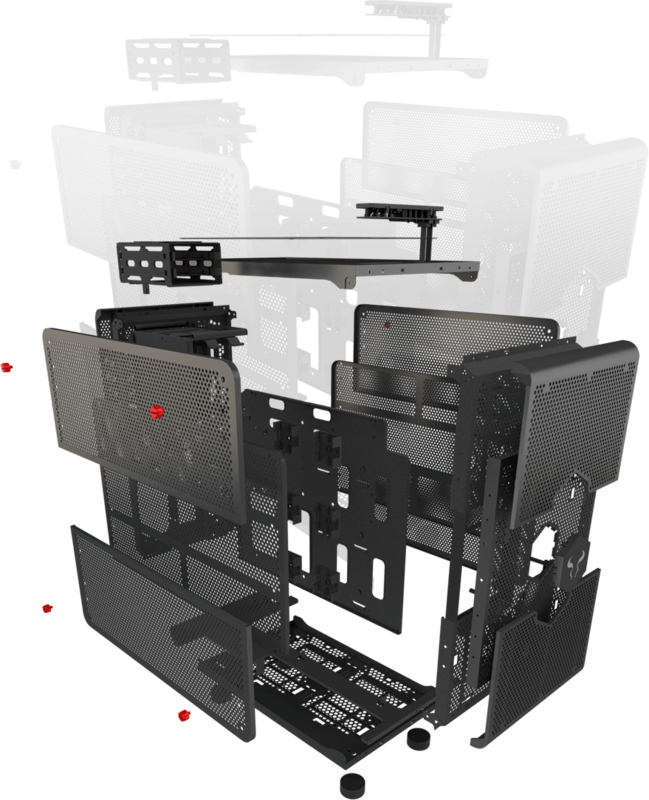 If the normally micro-ATX chassis isn’t big enough, then users can literally pull the bottom half of the case away from the top of the case, add a support connector, and rebuild the design in E-ATX mode. These modes are called Mid-Tower and Mini-Tower. Moving from one to the other changes the height from 15.1 inches to 17.5 inches. In order to make assembling easier, Riotoro has gone for a dual chamber design, with Motherboard/CPU/GPUs in one half and PSU/Storage in the other. This helps for cable management and cooling when everything is in place. The motherboard uses an upside down placement, meaning the GPUs are at the top, so that should be taken into account. 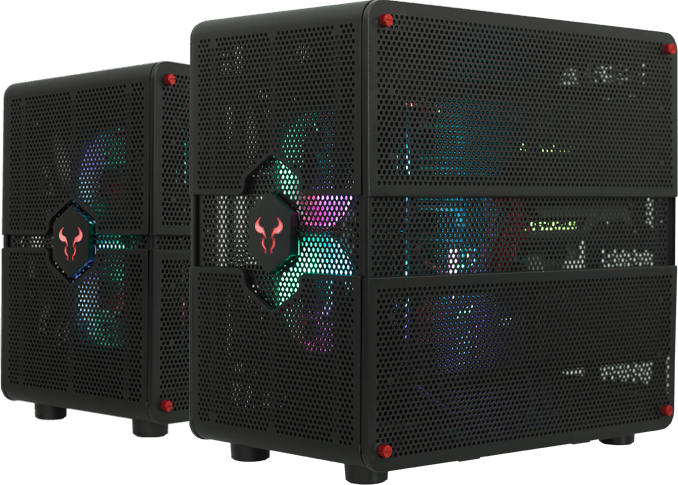 Aside from supporting bigger motherboards in the larger mode, the chassis can also take up to 4 GPUs and another couple of SSDs with two more tool less 2.5” drive bays. 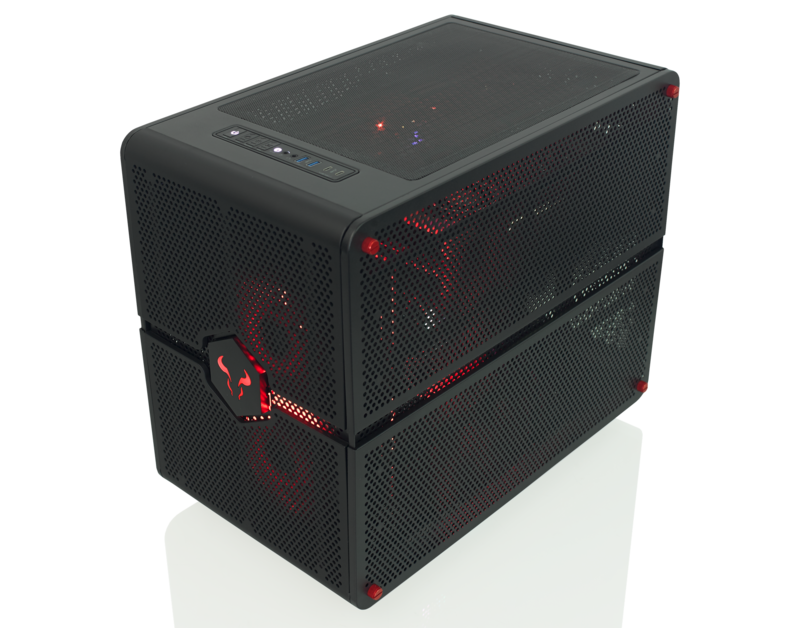 The case comes with two RGB fans fitted to the front and one in the rear. The front fans can be used in both modes. In Mid-Tower mode, a total of six 0/140mm fans can be used, while Mini-Tower also gives six, but the reduced z-height doesn’t allow for liquid cooling on the top of the case. While the case looks like it is full of holes, there are dust filters on the front, an acrylic panel on the top, and magnetic dust filters in other places. The front panel has two USB-C ports, two USB 3.0 Type-A ports, and the whole case is a toolless design. The only response I really have is ‘eh, what?’. It’s a neat concept and all, but don’t most users know the size of their build before buying the chassis? Now I can imagine that the chassis is retained through multiple builds, and users might go between a smaller system and a larger system, but where exactly do I keep the extra parts while in the small mode? I can imagine losing them, or putting them in box that I won’t remember a few years down the line. Perhaps I don’t get it. Do you?